Scott Arfield's goal gives Burnley victory. Well, Scott Arfield's second half strike was all that separated the sides in an entertaining East Lancashire derby. The talking point will definitely be the two shouts for a penalty which, if given, could have changed the game going into half time. But Sean Dyche will be happy with the result, which takes his Burnley side to second in the Championship table for the time being. Meanwhile, Blackburn are winless in their last four games and lie in 17th place in the table, three points off the relegation zone. Finally, you can read the report from today's match here. Thank you for joining us. Good afternoon! "It's always great to play in a derby and I'm fortunate enough to play in a lot of good ones but this was a great battle today. "I thought I should have been given a penalty but justice has prevailed so I have no problem. The referee has a lot of decisions to make and I thought he was excellent today." "I thought the boy [Tom Lawrence] was looking for a penalty and he asked the question but some decisions go your way and some don't." "We hadn't won [in this fixture] for a number of years until a few years ago so to come back and do it again is fantastic. "I've seen a gap and put it closest to the top corner and I think the keeper gets a fingertip but I'm delighted. "It's brilliant for the fans, more so than me." Despite a late effort from Shane Duffy, Tom Heaton produces a fine save to deny his headed effort. Hope Akpan then unleashes another header, this time from a Craig Conway corner, but Heaton claims the ball again before the final whistle blows. Burnley have taken all three points. Craig Conway sails another free kick into the box but Shane Duffy is judged to have fouled Burnley keeper Tom Heaton. That just about sums up the last twenty minutes for the hosts. Three minutes added time given and the travelling Burnley contingent are in fine voice. Craig Conway delivers a free kick into the Burnley box which drops to Shane Duffy who taps an effort over the bar. Blackburn are running out of time. Andre Gray departs the field after a poor afternoon. He's replaced by Chris Long. Craig Conway cuts in from the left and unleashes a shot from range which cannons off the upright. Can Blackburn find a way into this? Joey Barton has been brilliant today. The Burnley man has anchored their midfield and proved vital in last-minute tackles. Barton superbly clears away the danger as he tackles Hope Akpan before he could launch a shot through on goal. Nathan Delfouneso is taken off and Chris Taylor makes his return for Blackburn. Craig Conway sends a corner into the box which Shane Duffy misses but the ball drops to Grant Hanley whose shot is blocked. Maybe Blackburn aren't out of this one just yet. Craig Conway launches a hopeful cross into the box towards Nathan Delfouneso but Tom Heaton coolly catches the ball. The sting has definitely been taken out of Blackburn. They have 20 minutes to find their way back into this match. Well Burnley's opener has totally changed this match. Scott Arfield's strike came entirely against the run of play, with the hosts looking comfortable with the ball and unfortunate not to take the lead themselves. Tom Lawrence tries his best to get Blackburn back in it, but cannot make up for his earlier miss as his long-range drive is well scooped up by Tom Heaton. A Burnley free kick is sent into the box and Blackburn struggle as the ball is cleared out but Scott Arfield is on hand to curl a superb shot past Jason Steele. Nearly 5,000 travelling Burnley supporters erupt at the far end of the ground. It's still not happening for Jordan Rhodes but he's getting closer to finding the back of the net. He latches onto a pinpoint long-ball and manages to get the better of Burnley's Michael Keane, but the Scotland striker sees his shot saved by Tom Heaton. Blackburn's tails are up, now. Ben Marshall proves himself a handful for Burnley's defence and strides past his markers before being brought down just outside the box but Corry Evans picks up where he left off and lets fly from range, but the ball fires just wide. How on earth Blackburn aren't 1-0 up here is amazing. Some great work from Nathan Delfouneso in midfield allows Tom Lawrence to cleverly play the ball to Jordan Rhodes who immediately plays the ball back to Lawrence and splits a shellshocked Burnley defence. But Lawrence sees his effort fly over the crossbar despite him being completely unmarked in the box. It's just not Andre Gray's day today and his head's in his hands after he squanders a chance at the far side of the pitch as he buries a shot that's fortunate not to break the ozone layer. He's not been his usual self, this afternoon. A gamble from Michael Duff in the Burnley defence as Ben Marshall's ball sails from behind the halfway line into the box and almost catches keeper Tom Heaton out. A rare moment where the visitors have been caught out, there. Scott Arfield goes onto a mazy run into the box and Ben Marshall can't keep up, but fortunately for the Blackburn defender, Arfield's effort on goal fires into the side netting. A good start to the second half for the hosts and they could have taken the lead. Craig Conway runs down the left flank and sends a fantastic cross to Nathan Delfouneso at the far post but his header turns away from goal. Burnley get us back underway for the second half and neither side have made any changes. Plenty to talk about from the first half, most notably the two penalty shouts at either end. You have to say that Joey Barton must feel hard done by after he was felled in the box by Grant Hanley, but he was lucky not to give away a spot kick himself after colliding with Tom Lawrence. Elsewhere, Jordan Rhodes is yet to find a breakthrough for the hosts so far, but with seven goals this season, you'd fancy him to make an impact in the second half. Bit of a deceiving scoreline at the break. 0-0 just doesn't reflect this tasty East Lancashire derby well enough. Fulham: Lewis, Richards, Stearman, Ream, Husband, Fredericks, Tunnicliffe, Cairney, Christensen, McCormack, Dembele. Subs: Garbutt, Parker, Smith, Kacaniklic, Woodrow, Lonergan, Burn. Reading: Al Habsi, Gunter, Hector, McShane, Obita, Williams, Norwood, Blackman, Vydra, Piazon, Orlando Sa. Subs: Bond, McCleary, Hurtado, Tshibola, Ruben Lima, John, Cooper. Some more Blackburn pressure as Tom Lawrence works the ball to Jordan Rhodes again but the Blackburn striker fires the ball over from long range. And that's that for the first half. How it's remained goalless at Ewood Park is beyond me. Blackburn almost break the deadlock when Craig Conway sends a fantastic curling cross into the box and Jordan Rhodes beats his marker but heads it just over the bar. Another penalty appeal but it's at the other end, this time. Joey Barton, who was brought down himself remember, looks to bundle Tom Lawrence to the floor, but referee Keith Stroud is unfazed and waves play on. The home fans are incensed. The game is really opening up, now. Joey Barton links up with Scott Arfield who shoots at goal but Jason Steele parries his effort away. Andre Gray works the ball back into the box but Blackburn scramble it clear. Against the run of play, Blackburn run through on goal and Tom Lawrence unleashes a powerful shot from long-range but Burnley keeper Tom Heaton does well to catch the ball before Jordan Rhodes could latch on. At the other end, Sam Vokes tries his luck but the ball flies well wide of the post. Game on! Burnley haven't sat back after Joey Barton's penalty claim. The Clarets midfielder has shored up their attack and is making a nuisance of himself. As yet, neither side have found a breakthrough but surely we will be seeing some goals soon. England's cricket side playing Pakistan in the second Test of course includes Jimmy Anderson - the Burnley Express. You can keep across that by clicking here. Pakistan were 136-3 a short while ago. After some sustained pressure from Burnley, Joey Barton brilliantly bursts through into the box and is brought down by Grant Hanley but the referee waves play on, much to the fury of the 4,500 Burnley fans behind the goal. Blackburn have to count themselves lucky there. Craig Conway wins a corner for the hosts after Michael Keane deflects his cross out but the hosts make a bit of a mess of their advantage and eventually lose possession after Sam Vokes rises to clear. Kit Symons' Fulham welcome Steve Clarke's high-fliers Reading to Craven Cottage in another early kick-off. We'll bring you team news and score updates from that one. Meanwhile in League One, Millwall and Sheffield United are also locked at 0-0. The game has calmed down somewhat. The hosts look the more confident and they've given Burnley something to think about. The Clarets will want to avoid becoming too frustrated but have given away a cynical free kick after Ben Mee clatters into Craig Conway. Fortunately for the visitors, Blackburn couldn't find a way through on goal. First chance of the game goes to the hosts. Marcus Olsson fires a curling ball into the box and the onrushing Jordan Rhodes flicks a volley goalwards, but it sails just over the crossbar. The home fans will want more of that. Both sides are sizing each other up in the early stages, here. Burnley have enjoyed most of the possession as either side settle into the game. The home fans are in fine voice, though. A fantastic atmosphere in East Lancashire. An end-to-end start at Ewood Park. Burnley, shooting to our right, win an early free kick close to Blackburn's goal after Andre Gray is brought down but Jordan Rhodes nods David Jones' free kick clear. Blackburn get us underway in the East Lancashire derby. The teams have made their way onto the pitch at Ewood Park and kick off is moments away. The atmosphere is slowly building in Ewood Park as both sets of fans keenly await what is sure to be a bit of a tasty Lancashire derby. Both sides will be searching for a much-needed win at this stage of the season, but will there be a winner or will there be a fourth draw to add to the three from their last four meetings? The hosts make one change from their goalless draw with Derby in midweek as Craig Conway is selected ahead of Chris Taylor. Conway returns to the starting line up after picking up a foot injury in Rovers' defeat by MK Dons last Saturday. Burnley also make one change for this afternoon as George Boyd returns from an ankle injury and replaces Matt Taylor in midfield. Good afternoon and welcome! 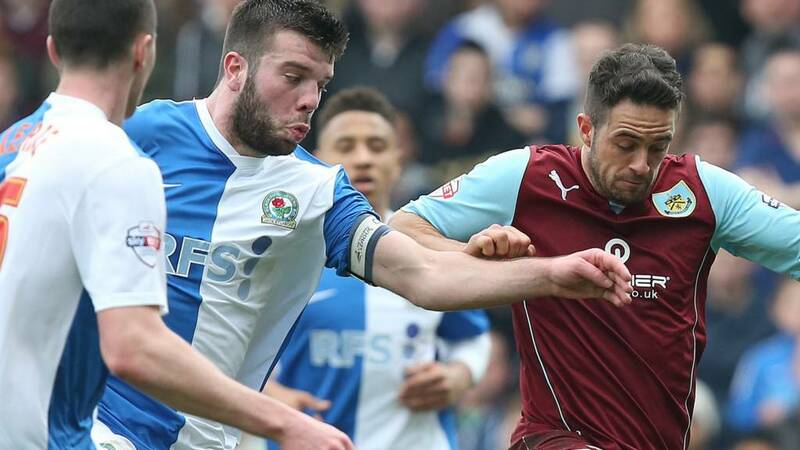 Today's lunchtime kick off in the Championship sees Blackburn Rovers take on Burnley at Ewood Park. Gary Bowyer's Blackburn will be searching for their first home win against Burnley since 2009, when both sides met in the Premier League. Despite Robbie Blake giving the Clarets an early lead, goals from David Dunn, Franco Di Santo and Pascal Chimbonda helped Rovers take all three points. Burnley will be looking to extend their unbeaten record in the Championship and a win today would see them move into second place in the table. Meanwhile Blackburn will want to kickstart their campaign having won just twice in the league this season.